A small update on Gideon. I have been working on the Ravenor miniature a bit less now. My set of Kingdom Death just came and I wanted to play a bit with it. The other factor was I did have some problems with the miniature itself. The thing is – the model is extremely detailed, one of the best sculpts I ever seen, BUT it is also much smaller than what I am accustomed to work with. Hence, getting the effect I want to achieve is much more difficult. For example, I repainted the head three times, as I wasn’t satisfied with the results. The effect is pretty neat – but it took a surprising amount of time to achieve it. Secondly, I am not sure about the colour choices I did. They seem not to work out as I planned. I wanted to use true metallics, which turned out bad and I had to repaint the elements with NMM. Which is much more difficult (and doesn’t look too good) due to the size of the miniature. 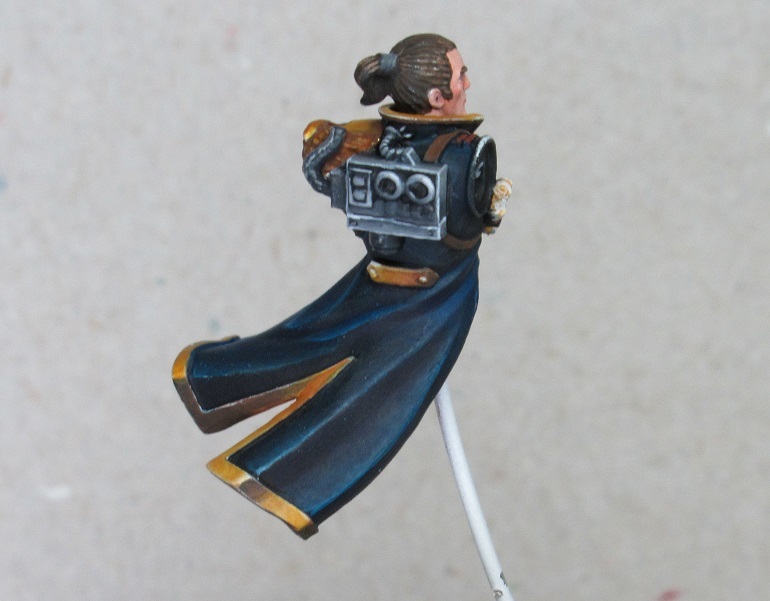 Another example is the cloak – I like how it looks, but honestly it doesn’t work well with the other elements I painted. The colour seems to be de-saturated. I will try to fix this with a glaze of a stronger blue paint. Lastly – I have been waiting for the last couple of months for the Custodes Commander miniature. I will probably grab the box at the weekend. Hence, there could be delay in me finishing Ravenor. Anyway! A bit more about the the model! About a year ago, I spoke with Mr. Gareth Nicholas about his approach to painting faces – and specific colours he uses. At that point he recommend me a number of paints produced by Reaper Miniatures, that he uses often for his work and a tutorial he really liked (clicky!). Never painted much with them – so it was pretty new to me and I usually paint more tanned skin – but I really like the effect here. Moreover, I also included some painting approach I got from Ben Kommets patreon page (clicky), the one with colour distribution on faces. Quite simple approach here – Base was Caspian Blue + Black. For highlights I added Linen White, for darker areas I simply added more black. I like the colour / highlights placement – but after getting back home I will add a glaze of Blue from Coat D’Arms – I think increasing saturation will tie the colour composition better. If not, I am considering repainting the whole thing black. After I wrote this, I actually did that. Didn’t help. To be honest the effect is far from what I wanted to achieve. Base is Dubai Brown, Highlights were done with addition of Yellow from Coat D’Arms and Linen White. Shade were done by adding glazes of Chestnut Brown. At this point I will probably repaint the model.